Franz Zammit Haber had always dreamed of owning an MG TD. His dream has now come true. Photo by Tony Vassallo, Old Motors Club. Since an early age, there was only one thing on Franz Zammit Haber’s mind – that of being behind the wheel of an MG TD. In some inexplicable way, he developed a fatal attraction for that vehicle, and in his adolescence, dreamt of buying one once he started working. In the early 1960s, Franz began a career in the civil service. Alas, real life has a habit of bringing us back down to earth with a bang, and he soon realised that with his very modest salary, buying an MG TD was way beyond his meagre means. So he had to deposit his dream into deep freeze. “However, I kept my antennae on the classic car wavelength, and when I was unable to tune in onto the MG marque, I sublimated my expensive taste into purchasing a much more affordable old vehicle,” he said. “It turned out to be a red, 1936 Fiat Balilla. It was in a poor condition, so much so that there were gaping holes in the floor boards and light came through them. But it had a good working engine, and I drove it for many years. In the end, it developed differential problems, and my instinct told me to let it go. But while the Fiat functioned, it gave me a lot of joy. I can still clearly remember its number – 543”. With the departure of the Balilla, Zammit Haber turned lukewarm on classic cars, and he eventually went body and soul into a totally different realm – flying model aircraft. With his leadership skills, Zammit Haber soon became a committee member, and for 10 years served as president of the association. His passion for model aircraft saw him possessing 20 first class planes of competition status. For successful model aircraft flying, he lists two essential ingredients – quick reflexes and alert senses. On retiring from the civil service 10 years ago, it started to dawn upon Zammit Haber that, when it came to flying planes, his reflexes were slowing down, while his senses were not what they used to be. Being the constant realist, he consequently started to beat a slow retreat from his passion. Four years ago, while still remaining a member, he stepped down from the committee of the model aircraft association. He also decided to restructure his fleet, keeping just four, easy to fly aircraft, while selling the rest of the big planes. With more time on his hands, and nostalgia on his mind, the MG TD dream of his younger days started to haunt him. Only now the financial barriers were not as detrimental to his dream as they were before. Subsequently he spent months surfing the net, trying to find a right-hand model. He eventually found what he was looking for at a classic car company in the Netherlands. Determined to clear the air, he phoned the Dutch company to find out if anything was wrong with the vehicle. He was assured that it was roadworthy, and that it had undergone a restoration. The only snag, they informed him, was that it had no past history. Still unconvinced, he sought counsel from local classic car restorer par excellence Barry Owen, who also owns an MGTD. “Barry told me to ask the Dutch dealer to send me as many photos of the vehicle as possible, so that he could have a closer and more analytical look at it. So I did, and so did they. “After Barry thoroughly inspected the pictures, he told me that it was worth it. “He also concluded that since the Dutch firm was big and renowned, it had a respectable reputation at stake, which was a different proposition than buying a car overseas but from an individual”. Thereafter a deal was reached, and in May last year, the classic car was shipped from Holland to Malta. Zammit Haber went to the warehouse, started the engine, and off it roared. Days later, while having a closer look at it at home, he found that the electrical system was a shambles. He tried to repair it himself, but unaware that the vehicle was positive earth, his intervention resulted in damage to the wiring loom. 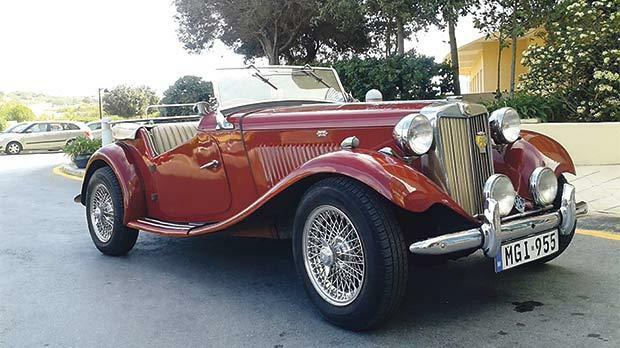 Having had experience in electrical engineering, Zammit Haber repaired the wiring system himself, after he had bought the manual and got the needed spares from two well stocked and reliable MG parts firms in the UK. Otherwise, the autumn red, 1950 MG TD, 1275cc standard , with twin SU carburettors, was in a very good condition and needed very little changes. Zammit Haber replaced the standard wheels with wire ones, while the carburettors were adjusted with the help of his mechanic friend Alfred of Zabbar. The MG T series was a range of body-on-frame convertible, two door sports cars produced by MG Motors between 1936 and 1955. The series featured the MG TA, the MG TB, the MG TC, the MG TD, and the MG TF. The TD model came off the line between 1950 and 1953. Having been in charge of the model aircraft association website for many years, Zammit Haber is now dedicating time to the Old Motors Club website, which needed upgrading and updating. He frequently takes parts in events, especially navigational runs, which in his opinion should be more user friendly as at present they are very technical to beginners. His wife Agnes is very supportive of his hobby, while he finds a practical pillar of assistance in his son Patrick. “Although he is an off road fanatic, he loves the old car, and being technical, he is a constant stream of advice, guidance and useful help,” he said. Zammit Haber is now enjoying the dream of his youth to the full. The fact that he has clocked up more than 2,000 miles in just over a year confirms that statement in no small way.